a gain to the kingdom,though a lost to the body of Christ. 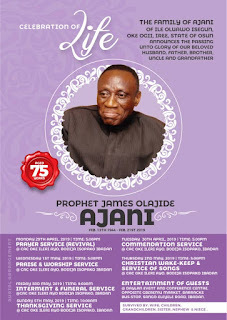 Prophet Ajani slept in the Lord on February 21, 2019 at age 75 after living a sacrificial life worthy of emulation. 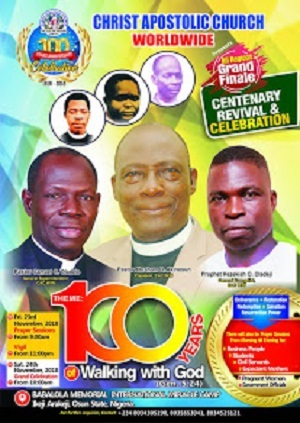 Pastor Ariyo told CAC NEWS that CAC has lost one of her old time religion crusaders and Apostles of truth. He further stated that the late Icon kept the faith, fight a good fight of faith and finished his course. The Cleric added that: "I celebrate the victorious exit of my spiritual father,mentor,and role model.Baba you are more than conqueror. Goodnight !" 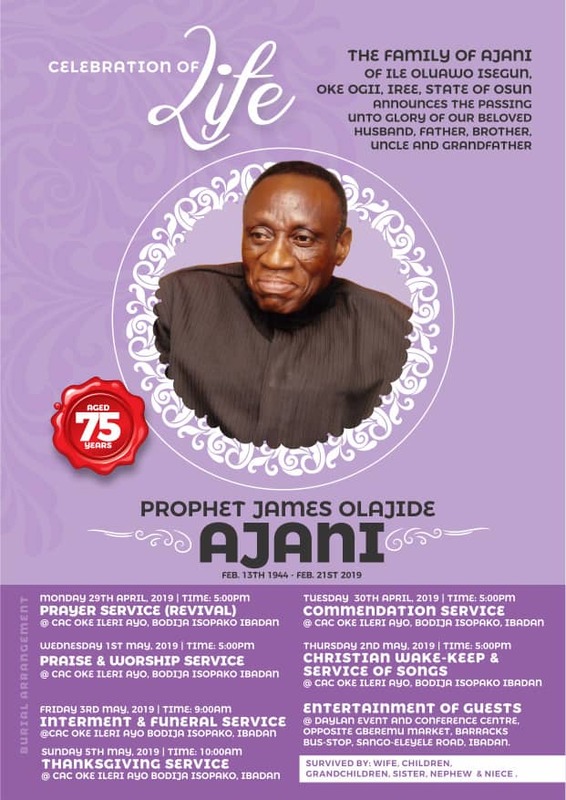 According to him, the late Prophet Ajani is one of the disciples of Baba Abiye and contemporary of retired Pastor Oyebanji and Pastor Babatola. He disclosed that the deceased is the planter of CAC Oke Ileri Ayo, Bodija, Ibadan Oyo State and was District Superintendent until his death. 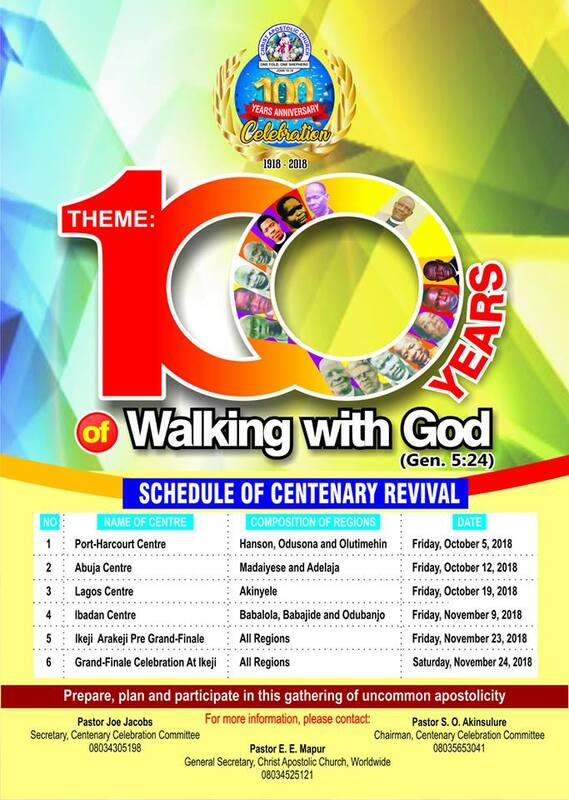 He said Prophet Ajani has worked and planted several churches in several place within Ibadan, Ode-omu,Edunabon and many more. Meanwhile, burial arrangement for late Icon has been unveiled. CAC NEWS gathered that Prayer Service (Revival) will hold on Monday April 29 by 5pm, while Commendation Service holds on Tuesday April 30th, 2019 by 5pm, both at CAC Oke Ileri Ayo, Bodija Ibadan. Praise and Worship Service and Christian Wake Keep/ Service of Songs holds on 1st and 2nd of May respectively by 5pm at CAC Oke Ileri Ayo, Bodija Ibadan. Prophet Ajani will be laid to rest on Friday May 3rd by 9am at CAC Oke Ileri Ayo, Bodija Ibadan. Entertainment of Guest holds on same at Daylan Event and Conference Centre, Sango-Eleyele Road, Ibadan Oyo state. Rest on Daddy Ajani a true man of God and a great Prophet of our time.